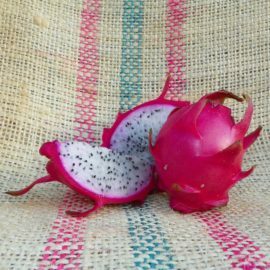 Pepino Dulce is a hybrid variety for the genus Hylocereus. 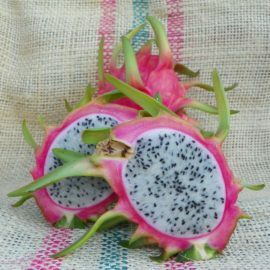 The fruit has bright pink skin with pinkish-green large fins. The flesh is very juicy and extremely sweet. Pepino Dulce is very fertile and produces an abundance of large round fruits. The average weight of the fruit is 1.5 pounds. However with selective bud removal fruits can easily weigh 2 pounds. The snowy white flesh has a delicate texture. Huge nocturnal blooms measure over 15″ across and blooms all summer long. This variety handles full sun quite well. The name Pepino Dulce in Spanish means Sweet Cucumber. 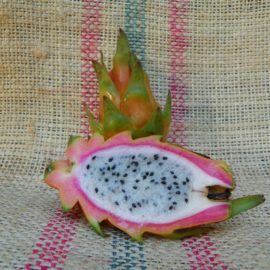 This variety is known to be self-pollinating and was acquired from a tropical nursery in California.